AC Soberano leads the three-point shootout cast, Eugene Toba is fancied in the dunk contest, while Robert Bolick banners Team Saints in the All-Star game. ROBERT Bolick will banner the loaded Team Saints when they take on Team Heroes in the 2018 NCAA All-Star Game on Friday at Filoil Flying V Centre in San Juan. The do-it-all skipper leads the cast for the Saints side, composed of players from San Beda, Letran, Perpetual, San Sebastian, and St. Benilde, with Red Lions coach Boyet Fernandez calling the shots. Also in the team are Javee Mocon and Radge Tongco, Bong Quinto, JP Calvo, and Christian Fajarito, Prince Eze, Edgar Charcos, and AJ Coronel, Michael Calisaan, Allyn Bulanadi, and Alvin Capobres, and JJ Domingo, Josh Barnes, and Luigi Velasco. Meanwhile, the Heroes crew, built on players from Lyceum, Mapua, Arellano, EAC, and JRU, will have their hands full as Pirates coach Topex Robinson tries to make do of his CJ Perez-less crew. Twins Jaycee and Jayvee Marcelino backstop the team together with teammate Toci Tansingco, Laurenz Victoria, Warren Bonifacio, and Cedric Pelayo, Levi Dela Cruz, Ian Alban, and Michael Canete, Jerome Garcia, Juju Bautista, and Jeric Diego, and Jed Mendoza, Aaron Bordon, and RJ David. Last year, the Saints got the better of the Heroes, 84-80, with Eze taking home the All-Star MVP honors. San Beda’s Eugene Toba is seen as the favorite as the league’s best high-flyers will take the spotlight in the Slam Dunk Contest. Giving him a run for his money are St. Benilde’s Justin Gutang, EAC’s Juju Bautista, Lyceum’s Enoch Valdez, San Sebastian’s Ken Villapando, Mapua’s Arvin Gamboa, Letran’s Renato Ular, Arellano’s William de Leon, and Perpetual’s Lean Martel. Red Lion sniper AC Soberano has also emerged as the man-to-beat in the Three-Point Shootout where he takes on some of the league’s elite shooters. Allyn Bulanadi of the Golden Stags, Jerome Garcia of the Generals, Toci Tansingco of the Pirates, Exe Biteng of the Cardinals, Rence Alcoriza of the Chiefs, MJ Dela Virgen of the Heavy Bombers, Koy Galvelo of the Knights, Carlo Young of the Blazers, and Luke Sese of the Altas have all thrown their names in the pool. It’s also an open race to the throne in this year’s Skills Challenge. Joining the fray are San Beda’s Clint Doliguez, San Sebastian’s Arjan dela Cruz, Letran’s Bonbon Batiller, Arellano’s Maui Sera Josef, Mapua’s Eric Jabel, Perpetual’s Jasper Cuevas, St. Benilde’s Jimboy Pasturan, EAC’s CJ Cadua, JRU’s Mark Mallari, and Lyceum’s Carl Lumbao. The school’s past, present, and future also unite as one in the Shooting Stars Competition with players from the juniors, seniors, and alumni teaming up with one another. 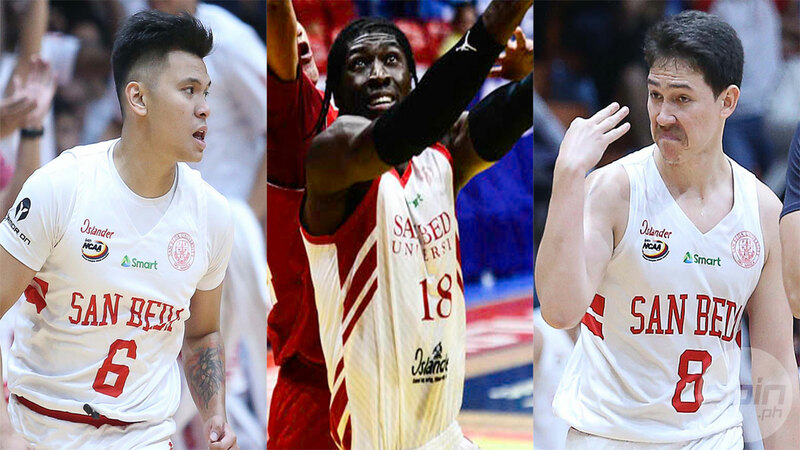 Marlon Espiritu, Kraniel Villoria, and Jio Jalalon will represent Arellano; Clint Escamis, Exe Biteng, and Yong Garcia for Mapua; Stacey Tibayan, Jerrick Balanza, and Ronjay Enrile for Letran; John Amores, Agem Miranda, and John Wilson for JRU; Yukihiro Kawamura, Jielo Razon, and Gerald Dizon for Perpetual; Penny Estacio, Calvin Oftana, and Marcelo Pascual for San Beda; Cjay Boado, Maui Cruz, and Bong Melocoton for EAC; John Barba, Kim Cinco, and Kevin Lacap for Lyceum; Francis Lopez, Jimboy Pasturan, and RJ Deles for St. Benilde; and Milo Janao, Ian Valdez, and Jepoy Quiamco for San Sebastian.